This Writer's Craft theme is "Luck and Magic"
Rebecca Caprara is a children's book author and illustrator. 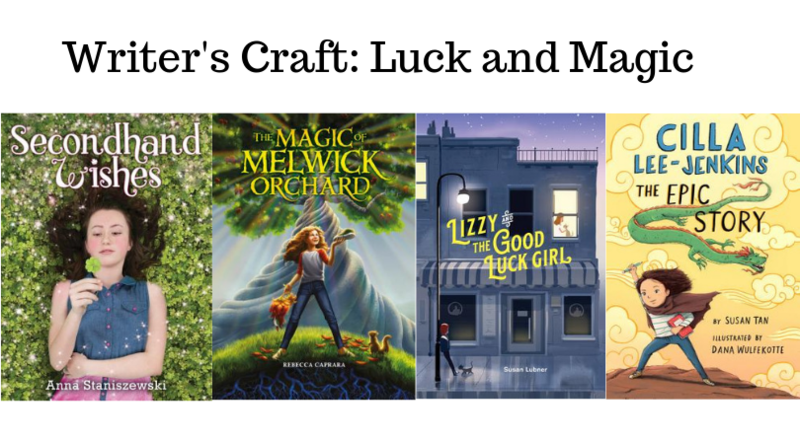 Her debut middle grade novel, THE MAGIC OF MELWICK ORCHARD was published in September 2018 by Carolrhoda Books, an imprint of Lerner Publishing Group. Her next novel, WORST-CASE COLLIN will be published by Charlesbridge in 2020. In 2017, she received the Marguerite Davol Picture Book Manuscript Scholarship, as well as the Jane Yolen Scholarship from the Society of Children's Book Writers & Illustrators. Born in Poland and raised in the United States, Anna Staniszewski grew up loving stories in both Polish and English. She was a Writer-in-Residence at the Boston Public Library and a winner of the PEN New England Susan P. Bloom Discovery Award. Anna lives outside of Boston, Massachusetts, and teaches at Simmons College. When she's not writing, Anna spends her time reading, eating chocolate, and challenging unicorns to games of hopscotch. You can visit her at annastan.com. Secondhand wishes come with some hilarious, unintended consequences, from middle-grade darling Anna Staniszewski.